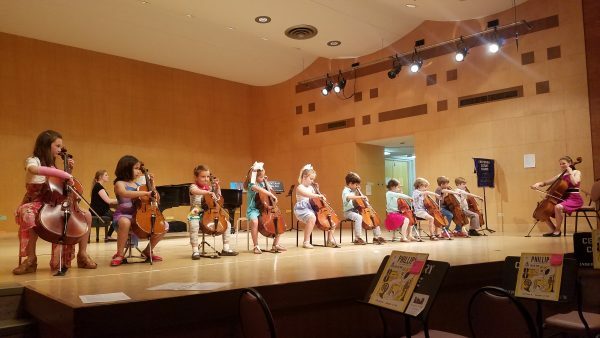 There are many chances for your children to perform in our program! 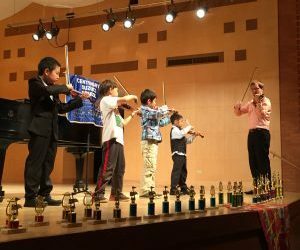 Playing a piece of music on stage helps your child’s stage presence and nerves of steel in any situation – giving a speech, dancing, drama, etc. In addition to the following opportunities, we encourage students to perform in school, church, and other venues of their choice. Each year in April CSS presents an Annual Ensembles Concert on a Tuesday afternoon at group class time. 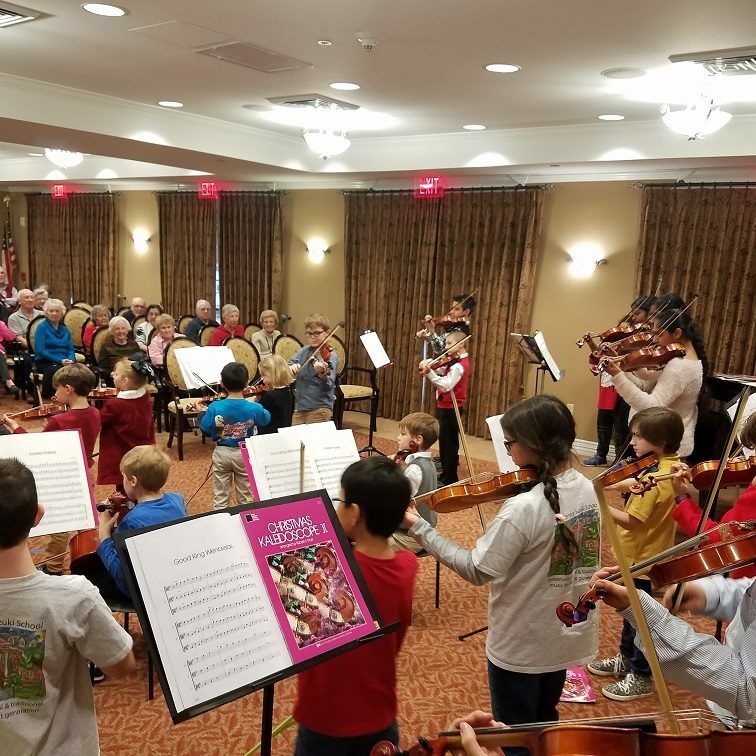 This concert features all three orchestras and the advanced groups. This concert happens on a Saturday afternoon in early May. 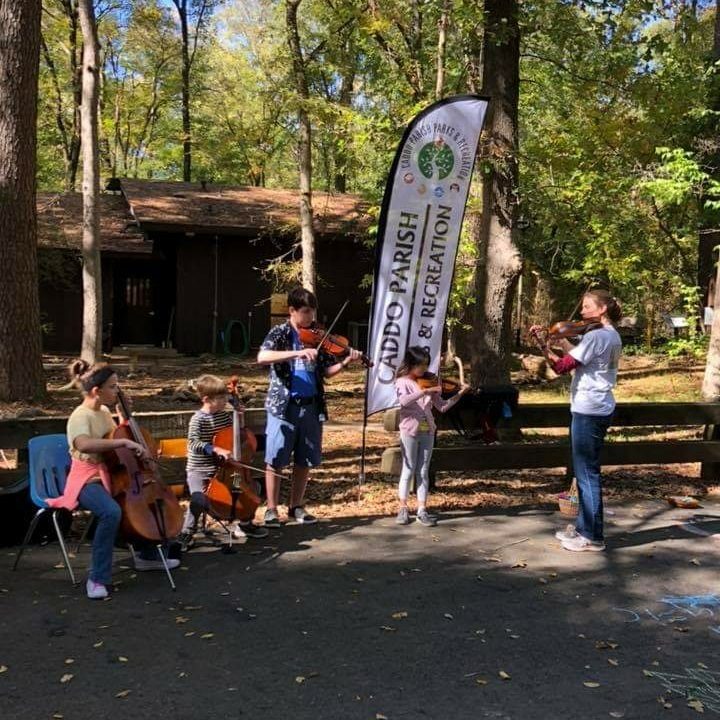 This is an opportunity for you and your children to hear all the various levels of violinists, violists, and cellists in our program. The children may not always play their most recent pieces. Please, remember that obviously, the younger children will play a much shorter time than older ones who know many more pieces. This is a great chance for younger children to hear the beautiful advanced pieces they will play in a few years. 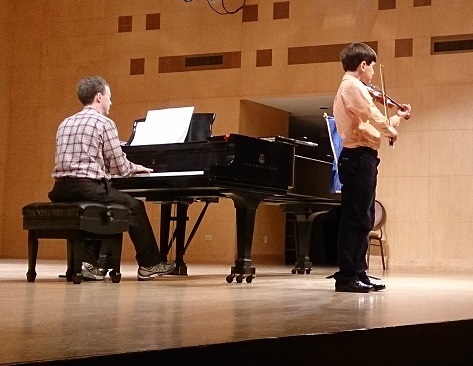 Older students need to remember (as they play their old pieces) that they are an inspiration for these younger ones. Our “holiday” concert is held the last Tuesday afternoon of the semester in December. This features the orchestra, chamber music and beginners playing holiday season tunes and traditional Suzuki repertoire. These are held once each semester. A group/or solo (if only one) performance of a selected piece will be presented by all those graduating from each book. To graduate the student should be on the second piece in the subsequent book from which he or she is graduating. (Exception: Violin Bk. 5, 1st piece in Bk. 6) This way, the student can be comfortable performing technically and musically, and those around him can also be comfortable! We have had students who are just starting the last piece in a book a few weeks prior to the graduation recital. Many times, they or their parents will “push” the child to learn the piece in the “nick” of time. 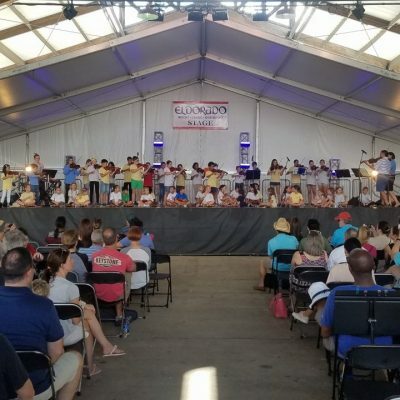 Please do not rush a child through, or the child will obviously not feel as comfortable on stage as those who have truly polished the last piece. Remember, it’s not how fast you go; what counts is how well you play. Trophies are awarded at the end of the recitals. 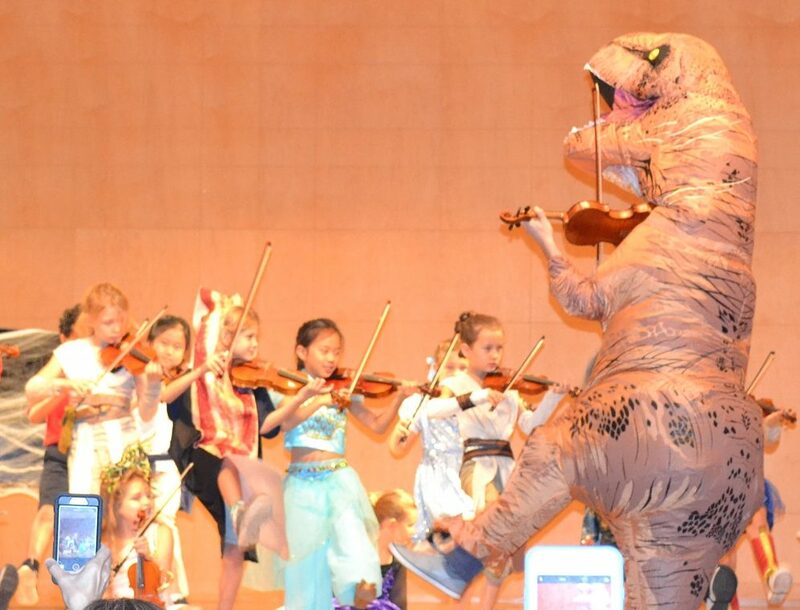 “Spooky Suzuki” is a FUN Halloween Play-Down Informal Concert where pieces from Suzuki Books 1 to 5 will be performed! Beginners may bring their “foamolins” and play “creepy” rhythms, and a few complimentary pieces. Halloween costumes are encouraged! Students leave their Halloween bags outside of the auditorium and parents bring candy (or apples, cookies, raisins, or toothbrushes…) to share. These extra solo recitals happen twice every year. 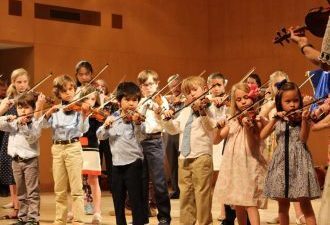 They are an extra performance opportunity to honor those students who have been practicing consistently and are ready to perform on the stage. It does not matter if it is a Twinkle Variation or a Paganini Caprice, what is important is how well it is prepared. Review pieces are highly recommended. If you would like to play, talk with your private teacher and choose a well-polished piece, no longer than 4 minutes. Due to the length of the recital, we always have very limited spots. Every year, we organize extra performances around the Shreveport. At Nursing homes, during the Red River Revel performance in October, and other community opportunities are available throughout the year with online sign-up. For formal concerts, performers should wear nice clothes. Skirts must be at or below the knee. (Skirts look shorter from the audience level below the stage!) If you do not have such a skirt, please wear pants and a dressy top. No T-shirts of flip-flops.